A quick guide on building a static grass applicator. This is part two, the electronics. 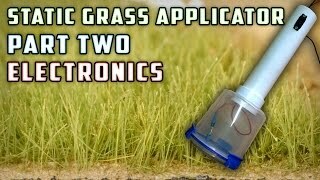 In part two I’ll show you exactly how I wire the static grass applicator to complete the final product. This applicator work very well on all the static grass brands I’ve tested, woodland scenics works very well and mininature grasses also perform quite well. It’s great for adding realism to your model railroad or if you do any other sorts of scenery like war gaming, you will find this static grass applicator very useful. And it’s not very expensive! In total I spent about $35 on the materials. If you’re interested in going to part one click on the following link. Thanks for watching, hope you found some useful information. Feel free to share the video and if you’re not already feel free to subscribe and comment.